The 1950s were a special time for American automobiles. 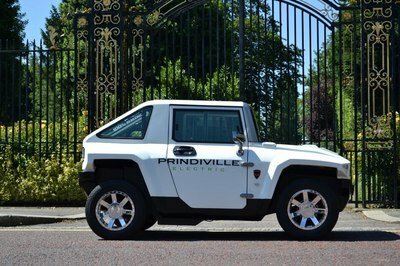 Chrome, big fenders, narrow wheels, and futuristic comfort features were all the rage. Chevrolet was perhaps the most pervasive brand of the era thanks to big hits like the 1956 Bel Air. This popular trend extended even into Chevy’s pickup lineup. 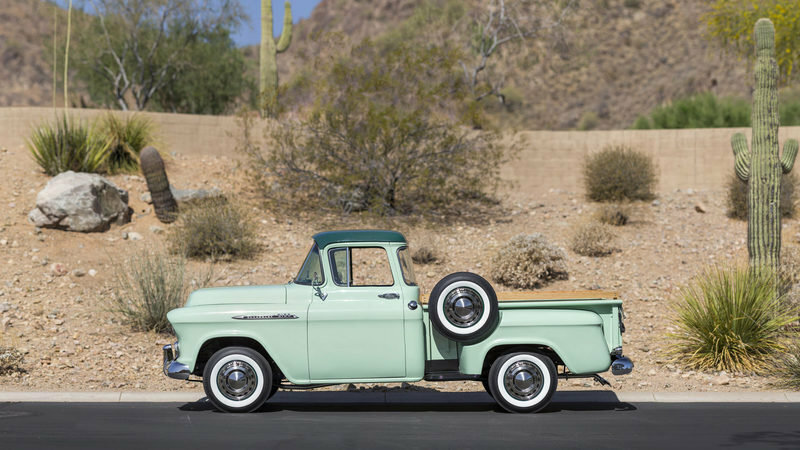 Introduced in 1955, the Chevrolet Task Force pickups featured all the right stuff, plus offered a heavier duty chassis than the Advance Design pickup series it replaced. The Chevy Task Force came with a striking new design that mirrored Chevy’s passenger car designs. The Task Force series also bought never-before-seen comforts to the pickup segment, including a wraparound windshield, wraparound rear glass on Deluxe Cab models, a larger interior, power steering, power brakes, a 12-volt electrical system, and an optional automatic transmission. What’s more, 1955 was the first year for Chevy’s legendary small-block V-8. Displacing 265 cubic inches, this 4.3-liter V-8 was the first V-8 in a Chevy pickup. 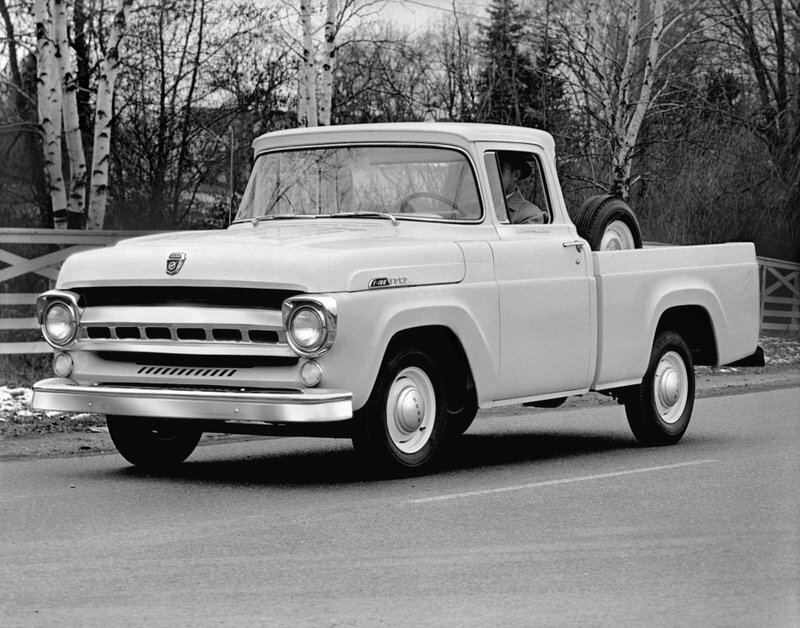 The Task Force series of pickups lasted from 1955 through 1959 when the Apache series, took over. The Apache also started carrying the C/K series designation, which denoted either RWD (C) or 4WD (K), and would soon take over as Chevy’s pickup truck names until 1999 when the Silverado trim line officially became the model name. But it was 1956 when Chevrolet built the truck you see here. This 3100 model foregoes the V-8 in favor of Chevy’s then-popular 235 Thriftmaster inline six-cylinder and four-speed manual transmission. It does sport the Deluxe Cab with the rounded rear glass, two-tone paint, and the optional heater package. 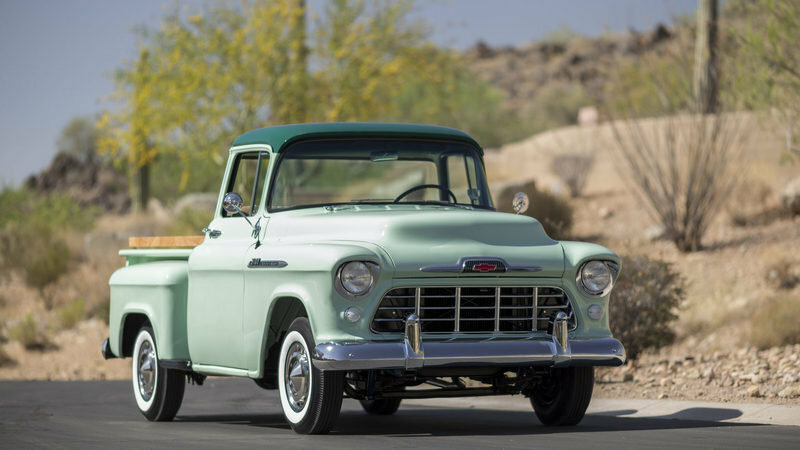 Mecum auctions will roll this meticulously restored truck across the auction block during the 2016 Monterey auction taking place August 18th through 20th. There’s plenty more information about this truck below the jump, so keep reading for more. Continue reading for our full review on the Chevrolet 3100 Pickup. 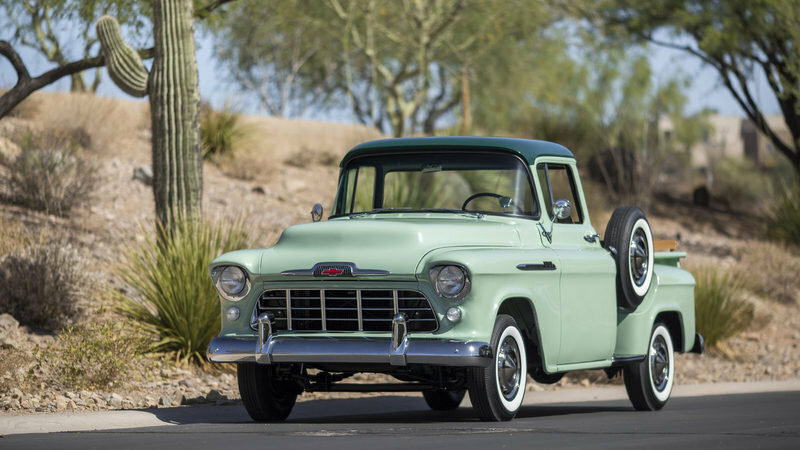 This 1956 Chevrolet 3100 is a pristine example of what mid-1950s Chevy pickups looked like when new. Chrome-plated bumpers, wheel covers, headlight rings, mirror caps, and big windshields solidify the look. Chrome-plated bumpers, wheel covers, headlight rings, mirror caps, and big windshields solidify the look. 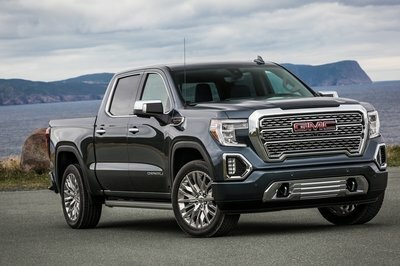 Up front, the chrome bumper includes guards that help protect the grille, while allowing the truck to push-start over vehicles – a common practice back in the day to bypass a drained battery. The egg crate grille and hooded headlights with chrome rings share a similar design language as the 1955 Chevy Bel Air sedan. The raised hood gave engineers all the room they needed for different powertrain options, all of which came with tall carburetors and big air cleaners The raised hood also allowed for the additional body line that ran rearward from the headlights, through the doors, and onto the cargo box. Out back, the bed is utility focused. The top bed rails are protected with oak planks. More oak lines the bed floor. Remember, spray-in liners wouldn’t be invented for another 40 years or so. Thanks to the step-side bed design, the wheel wells don’t interrupt the cargo hauling room inside the bed. 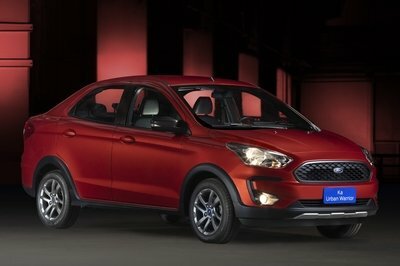 The hinged tailgate is supported via chains, which also serve as the locking mechanism. Two small brake lights were fine back then, though they’d never pass modern DOT muster. Period-correct BFGoodrich tires with whitewall sidewalls and Deluxe Cameo-style wheel covers finish off the factory-fresh look. 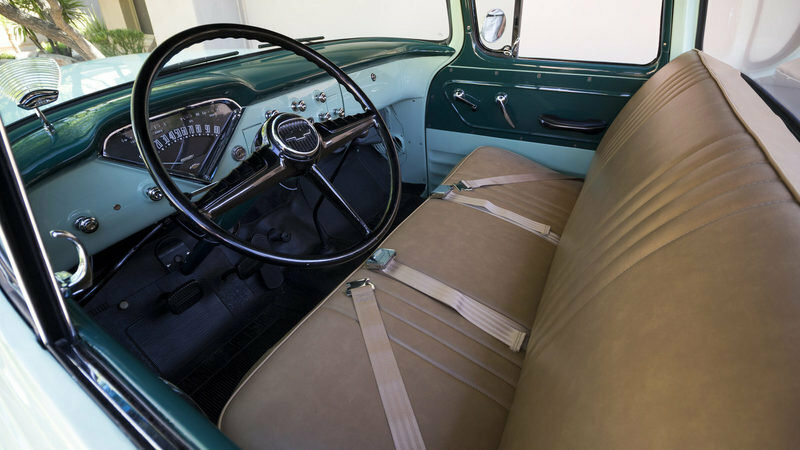 By modern standards, the interior of the 1956 Chevy 3100 is spartan and bare. However in its day, the Chevy’s interior was state-of-the-art in pickup interior design. It features a two-tone painted dashboard that matches the exterior, a V-shaped gauge cluster typical of period Chevrolets, and various knobs that control features like the manual engine choke, windshield wipers, and lights. This particular pickup has the four-speed manual transmission. The floor-mounted pedals are far different than the dash-hung pedals of today. And that pedal to the right of the accelerator? That’s the starter pedal, which engaged the starter motor after the key had been turned to “start.” Manual crank windows with side-vent glass are the only form of air conditioning. The wide bench seat offers room for three people. The seatbelts show here are likely an aftermarket addition, as most vehicles didn’t start coming with seatbelts until years later. Chevrolet offered three different engine choices for the Task Force pickups. There was the 265 V-8, the more powerful 283 V-8, and the base 235 inline six-cylinder. The straight six is what powers this example. The engine dates back to 1941 and held a storied history before the 1955 Chevy pickup came along. A version of this 3.9-liter engine even saw service in the C1 Corvette in 1953. Its simple design features a two-barrel carburetor that feeds air into the intake manifold. In this application, the engine produced roughly 140 horsepower and 210 pound-feet of torque. Of course, the Chevy 3100 is no powerhouse able to tow a 12,000-pound boat or haul two-ton boulders in its bed. Trucks weren’t built for that back then. Rather, the Chevy pickup and its contemporaries were designed to be honest vehicles for transporting good and men to jobsites or around the farm. These trucks were tools. That’s nevermore evident when looking closely at the engine. 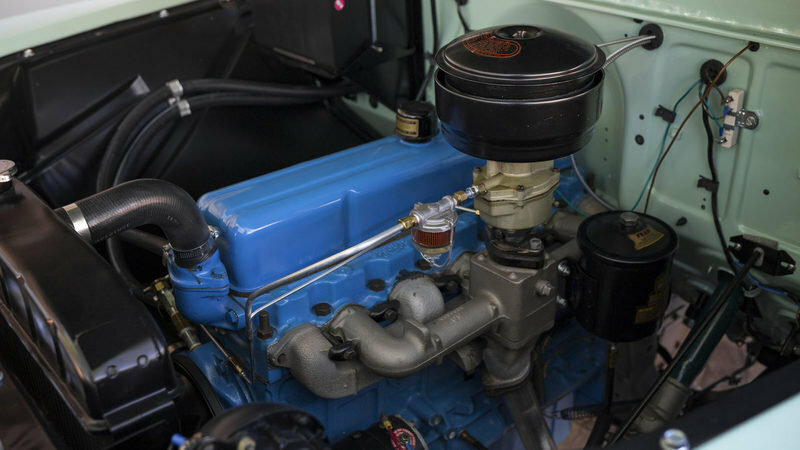 Its simple design features a two-barrel carburetor that feeds air into the intake manifold. Interestingly enough, the intake only features three pipes, which divide the air/fuel mixture between two cylinders each. It wasn’t the most effective method, but it worked. What’s more, check out how both the intake and exhaust manifolds are held against the block. Yep, it’s six bolts with retention tabs. Talk about easy maintenance! In reality, the Chevy 3100 is a half-ton truck, and back when it was new, a half-ton truck was literally rated to haul a half-ton of cargo. That means this truck could lug 1,000 pounds in its bed – not bad considering its timid engine specs. The price for a new Chevy 3100 in 1956 was $1,619. That might look inexpensive in modern times, but it was a hefty price back then. Even more, the price had increased from $1,494 for the 1955 model. Now in 2016, Mecum Auctions expects this pristine example to sell for between $50,000 and $60,000. Talk about appreciation. You can check out Mecum’s auction results here. The Ford F-Series was at the end of its second generation in 1956, but still offered strong competition against the Chevy. Like today, the 1950s F-Series included various weight classifications. In fact, two classes were offered for each F-1, F-2, and F-3. Competing against the Chevy 3100 was the F-1 – Ford’s least hefty half-ton with a 5,000-pound GVWR. Ford offered three engine options for the F-1 in 1956, including the 279 and 317 Y-block V-8s and the 223 Mileage Maker inline-six. The straight six made 137 horsepower and was mated to either a heavy duty three-speed manual, a three-speed automatic, or a four-speed manual. Dodge’s C Series debuted for 1954 and lasted through 1960. 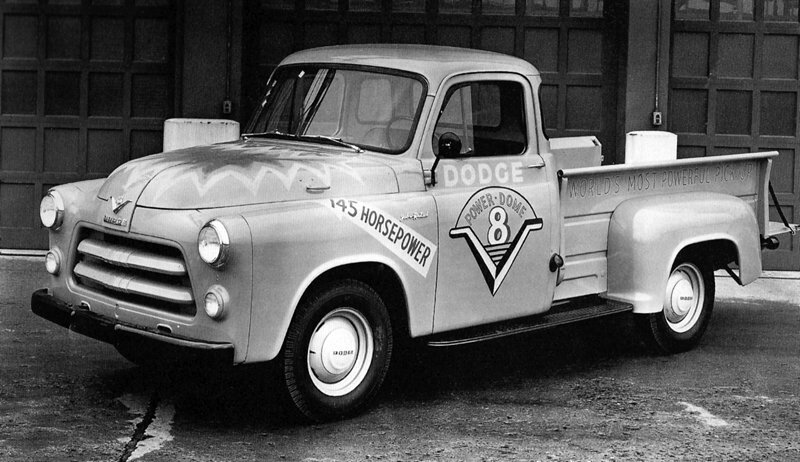 The C Series bridged the gap between the pre-war, B Series Dodge trucks and the more modern-looking D Series trucks. For 1956, the first generation of the C Series was in its last year. The Dodge also featured a stepside bed like the Chevy and Ford, making it easy to step up to the bed for easy reaching fro cargo. The C Series is also the first Dodge pickup to offer a V-8 engine. However, the comparable engine to Chevy and Ford’s I-6s was Dodge’s L-head 218 inline six, which made 100 horsepower. Unlike the other two, the L-head used a flathead design, having the valves inside the engine block. While the Chevy was the undisputed king of chrome for 1956 and the Ford wasn’t too far behind, the Dodge wasn’t the showiest model on the dealership lot. Dodge fixed this in 1957 with the second generation of C Series. More specifically, Dodge offered the “Sweptside model” that embodied the big-fix, big-chrome look of the day. 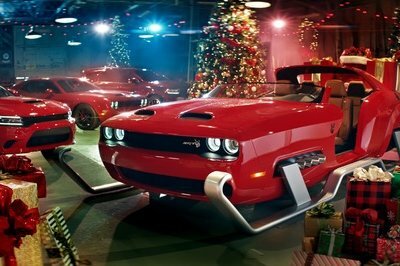 Still, the Dodge was the third mutt in two-dog fight in terms of sales. 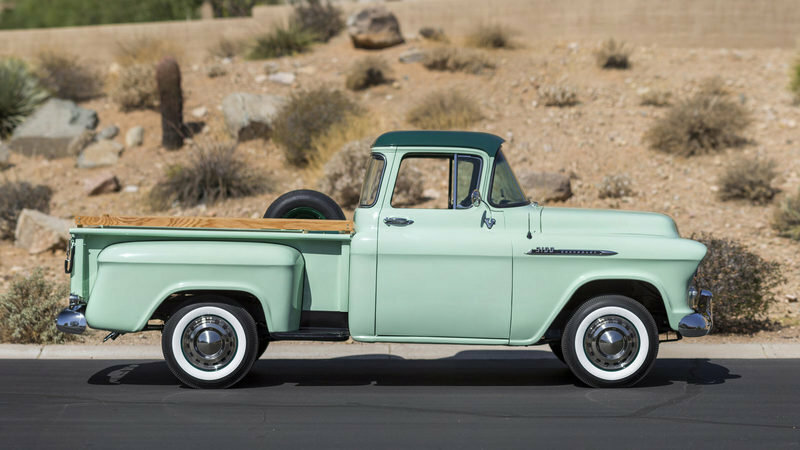 The 1956 Chevrolet 3100 pickup proved to be a fantastic workhorse during its day. The 1950s were a prosperous time in America, with growing cities, expanding infrastructure, and booming farmlands. 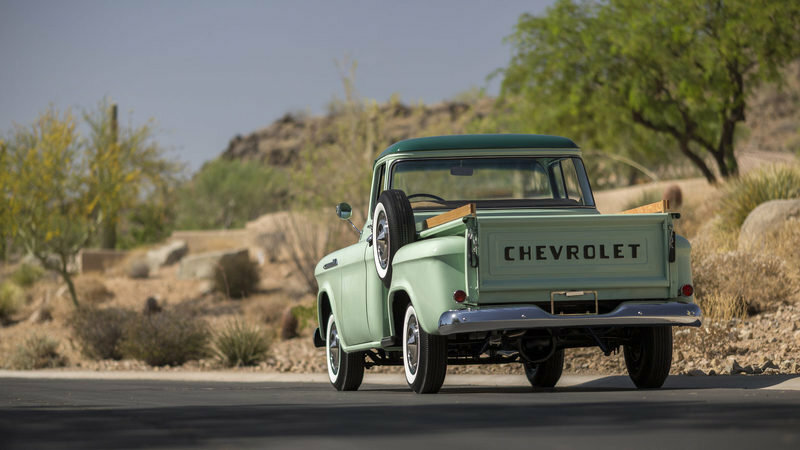 The Chevy 3100 helped the country grow while keeping the stylish looks of the day. Expect this pickup to sell well at auction and for its value to only increase in time. It might not be some rare Ferrari, but this classic Chevy is no less important to the history of the automotive industry and culture.